Despite not bowling particularly well for most part, Kerala's spinners feasted on variable bounce to pick up 13 wickets on day three and leave their side eyeing their first win of the season. 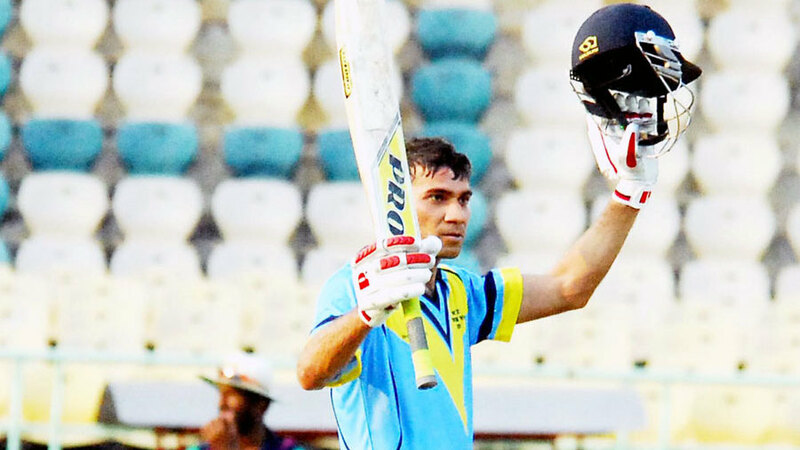 Despite a counterattacking 157 from Rajat Paliwal and his 197-run fourth-wicket stand with Yashpal Singh, Services were unable to avoid the follow-on. Sent in again, they slipped to 122 for 6 by stumps. They were 53 for 6 at one stage, before Nakul Verma and the aggressive Saurabh Kumar dragged the score into three figures and the match into the final day. Akshay Chandran, the debutant left-arm spinner, took plenty of punishment from Paliwal and Yashpal in the first innings but came back with five wickets in no time in the second. Legspinner Amit Verma took two wickets on the second evening and three at the end of Services' first-innings to claim his second five-for on the bounce, after his 5-61 against Tripura. The extent of the task ahead of Services, who resumed three down and 398 behind, was clear from the first over of the morning, when Paliwal shaped to sweep Vinoop Manoharan and saw the ball bounce over him and the keeper and run away for four byes. Scoring opportunities, though, were plentiful. With the ball misbehaving routinely, the spinners had plenty of men around the bat, but that meant little protection in the deep to cover for the frequent boundary balls. On 45 overnight, Paliwal went to his half-century by swinging Vinoop into the grassy banks beyond the midwicket boundary, and used the sweep and pull to pick up three fours off Chandran and Verma in the next six overs. At the other end, Yashpal came down the track to Verma and eased him past a sprawling mid-on fielder, before smacking the sightscreen with a straight six off Chandran. Kerala spread their fields when Paliwal entered the 70s, but this slowed the scoring only briefly, and Paliwal soon reached his century with a powerful sweep off Chandran. The Services dressing room erupted in cheers and applause, but Paliwal barely acknowledged the landmark, only stopping to take his helmet off and shake the sweat out of it. Paliwal reverse-swept Vinoop for another four three overs later to move Services past 200, and Yashpal pulled Verma for six in the next over. When Kerala brought back their only frontline seamer, PU Anthaf, Paliwal pulled and whipped him off his legs for two fours in one over. Neither batsman looked in any trouble, but it would only take one oddly behaving ball to break the partnership. Rohan Prem, the part-time offspiner, delivered that ball, which leaped off the pitch as Yashpal stretched forward to defend and popped up off his gloves, towards the vacant silly-point region. Wicketkeeper Nikhilesh Surendran darted from his spot and scooped up the catch with his right glove, millimeters off the ground. The partnership had come off 250 balls, at 4.73 runs per over. These numbers were evidence of a dominant morning, but Services were still 241 behind. They had only added two more runs to their score when Rohan struck again, getting one to keep low to trap Hardik Sethi on the back foot, with two balls to go for lunch. Paliwal was out soon after lunch, popping a catch to silly point off Verma, and he was batting again with two overs left for tea. In between, Verma looked unplayable, getting a couple of his legbreaks to rear at the keeper's head, and the Services lower order didn't really have the tools to combat him. Chandran then took out both openers after Kerala enforced the follow-on, Sumit Singh scooping a catch to mid-on and Soumik Chatterjee bowled through the gate. After tea, Services' middle order crumbled so quickly that a three-day finish looked possible at one point. Anshul Gupta nicked Chandran to slip, Sethi trod on his stumps while looking to pull, and Yashpal heaved across the line to give Vinoop his first wicket of the match. Having watched this procession from the other end, Paliwal soon joined it, as Chandran got another ball to scoot low and trap him on the crease. Even he could defy the conditions for only so long.